This function allows you to convert an email to SMS message. 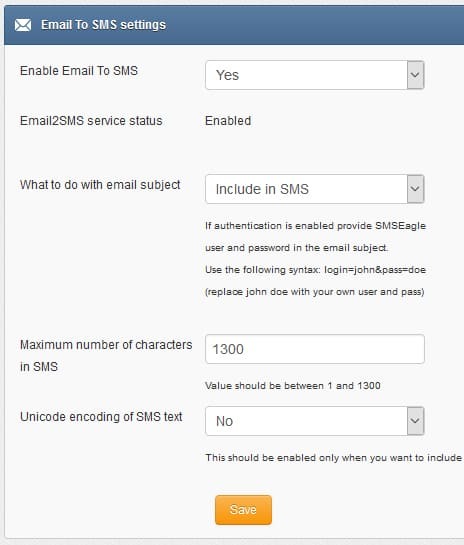 See a short video presentation on how email to SMS function works. will be converted to SMS message. The text of the email is the text of the SMS message (optionally you can append email subject at the beginning of SMS message). Example: email message sent to the address: 123456789@192.168.0.101 will be converted to SMS message and delivered to phone number 123456789.
will be converted to SMS message and will be sent to a user or users group from SMSEagle’s phonebook. Example: email message sent to the address: db-admins@192.168.0.101 will be converted to SMS message and delivered to all members of db-admin group. The db-admin group must be defined in your SMSEagle phonebook. It is also possible to use Fully Qualified Domain Name in an email address sent to SMSEagle box (eg. : 123456789@mydomain.com). Please refer to our FAQ article: How do I configure Email2SMS plugin to accept FQDN email addresses for more details. The text of an email will be cropped to the value ‘Maximum number of characters’. Maximum allowed length of SMS message is 1300 characters.